After adding clients, you can add products to their client profiles. Click on the client that needs new products. If the client has already granted permission for you to purchase products, click Start shopping. If you don't have permission from the client yet, click Add Products. Browse the Shop for products list and add products to the cart. Note: You may adjust the term lengths on products before sending them to the client. Term lengths default to three years in most cases. 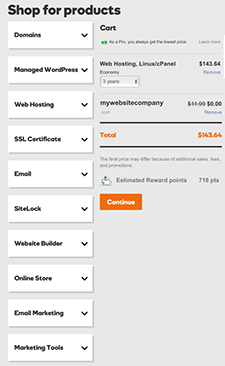 This example shows web hosting for a three-year term and a domain added to the cart. When you're done shopping, click Continue. Select Client's card to check out using the client's account and payment method on file. You won't see this option if the client hasn't given you permission to manage and purchase their products. Select My card to check out using your GoDaddy Pro account. Products are held within your account. Select Email cart to client to send the shopping cart to the client. The client completes the purchase, and we'll notify you when the purchase is made. Depending on your selection, click Continue to Check Out or Send cart. Follow the prompts to complete your purchase, or wait for the client to complete the purchase. After the client completes the purchase, a confirming message appears in the Recent Activity feed. Note: If you don't have access to the client's account when the client checks out, the order confirmation screen also notifies the client that you need access and includes a “Set Access Level” link.